Learn about Egyptian burial ritual; its place with ancient Egyptian cosmology; and the insights that mummies, burial rites, and cosmology provide about life in ancient Egypt. The exhibition focuses on Smithsonian science and what museum experts have learned about burial practices, health, disease, and demographics from studying mummies. In the Mummy's Tomb is a re-creation of a tomb with a mummy and its coffin (ca. 150 BC to AD 50 ) and a variety of grave goods from various periods (ca. 3500 BC to AD 50). Such grave goods were intended to provide the deceased with the spiritual and physical support needed for smooth passage to eternity. Making a Mummy reveals the step-by-step process of mummification. Scientific studies indicate that the 2,200-year-old mummy on view ate little meat and that his lungs contain soot, which he probably inhaled while tending fires. What’s in a Face displays 6 mummy masks dating from ca. 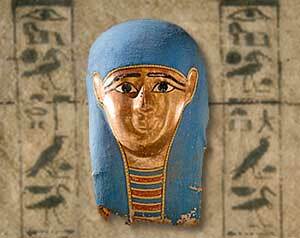 1388 BC to AD 200 to trace the changing style of coffin decoration and to bring visitors face-to-face with the living people behind the mummies. Mummy Science reveals insights into burial practices, health, disease, and demography that can be gained from the study of mummies. Animal Mummies explains the link between animal mummification and the Egyptian belief system and features the museum’s two Apis bull mummies and mummies of cats, ibises, hawks, crocodiles, dogs, and a baboon. Tentkhonsu’s Coffin showcases the richly decorated inner coffin of Tentkhonsu, a member of a group of noble women who participated in temple services and festivals. Preparing for Eternal Life explores how living Egyptians tried to assure they and their families would have eternal life after death. The Gods and Eternal Life explores the roles of two prominent gods, Osiris and Re, in helping the dead achieve eternal life and in keeping the natural order of the world of the living. Insects in Ancient Egypt reveals that insects were an important part of preparing for the afterlife and became symbolic of the transition.